OCD is a disorder that has a neurobiological basis. Put simply, it’s a potentially disabling illness that is characterized by persistent, uncontrollable thoughts, impulses, or images that are intrusive, unwanted and disturbing (obsessions) and ritualistic behavior (compulsions) performed in response to these obsessions. While symptoms vary, many people with OCD suffer greatly because they feel trapped in a never-ending cycle of worry. OCD tends to be a chronic condition, and currently, there is no cure. But there is hope; an effective treatment for OCD is available in the form of Cognitive Behavior Therapy (CBT). CBT, which has helped many thousands of people gain relief from OCD, is recommended by the Mayo Clinic, the National Institutes of Mental Health and Harvard Medical School. Medication is sometimes used, alone or in combination with Cognitive Behavior Therapy, to treat OCD. People with OCD are sometimes depicted in movies or television programs as somewhat eccentric and comical characters. But anyone who has OCD – or anyone who knows someone with the disorder – realizes it’s no laughing matter. There’s nothing funny about the suffering caused by OCD. If you have OCD, think you may have OCD, or care about someone who has or may have OCD, try to learn as much as you can about it. Information is a powerful tool in the fight against this potentially debilitating illness. Millions of people across the world are affected by OCD. Current estimates are that approximately 1 in 40 adults in the U.S. (about 2.3% of the population) and 1 in 100 children have this condition. OCD is characterized by obsessive thoughts and/or compulsive behaviors that significantly interfere with daily life. Obsessions are unwanted, recurrent, and disturbing thoughts, impulses or images that are difficult to suppress and cause overwhelming anxiety, doubt, or distress. Compulsions are repetitive, ritualized behaviors that a person feels driven to perform to alleviate the anxiety or discomfort created by the obsessions. The large majority of people with OCD know their obsessions and compulsions are excessive or irrational, yet they have little or no control over them. When this kind of behavior takes up a significant amount of time (at least an hour a day, but usually more), it may be symptomatic of OCD. Is there a Test for OCD? There is no laboratory test that can detect OCD. However, to begin evaluating symptoms you may be experiencing, take the OCD self-screening test. The test can give you insights into your thoughts and behaviors. Regardless of what your self-screening test may reveal, only a qualified mental health professional trained in the diagnosis and treatment of OCD can conduct a proper assessment to determine if you have OCD. Although reported figures vary, it has been estimated that two to three percent of new mothers experience Postpartum OCD (PPOCD) after the birth of their baby. With this disorder, a woman may have obsessive intrusive thoughts about her baby’s safety, causing severe distress. Other Specified Obsessive-Compulsive and Related Disorders, e.g., obsessional jealousy, which is characterized by a nondelusional preoccupation with a partner’s infidelity and repetitive behaviors or mental acts performed in response to these infidelity concerns; and body-focused repetitive behavior disorders such as nail biting, lip biting, and cheek chewing, which are accompanied by attempts to decrease or stop the behavior. Many people are eager to explore the cause of OCD as if this information could provide clues about why or how they acquired the disorder – and potentially reveal ideas about what they could change to make OCD go away. This is an unrealistic belief. You can’t change the fact that you have OCD, and OCD isn’t contagious – no one among your family or friends can “catch it.” OCD is not a result of how you were treated as a child, and it isn’t caused by job pressures or other stressful life situations (although stress can make OCD symptoms worse). Is there a treatment that can give me relief from OCD? Fortunately, there is an excellent treatment for OCD: Cognitive Behavior Therapy (CBT). An extensive body of evidence supports CBT as the most effective behavioral treatment for this disorder, and it is recommended by nationally-recognized institutions such as the National Institutes of Mental Health, the Mayo Clinic, and Harvard Medical School. This therapy uses two techniques: Exposure and Response Prevention therapy (ERP) and Cognitive Therapy. Thousands of people have been helped by making the commitment to CBT and working with a therapist who is trained to treat OCD patients. Although the benefits of Cognitive Behavior Therapy over medication have been consistently supported by research, a combination of CBT and medication is the most effective treatment for some people with OCD. Cognitive Behavior Therapy, sometimes accompanied by medication, is the only scientifically-supported treatment for OCD. A key factor in gaining relief from OCD is making the personal commitment to treatment. To get better, a person must agree to undertake a program of Cognitive Behavior Therapy (ERP and Cognitive Therapy), attend sessions on a schedule determined by his or her therapist, and do “homework” between sessions. In most cases, CBT sessions are conducted as out-patient sessions. Effective treatment can help most people with OCD achieve significant relief from their symptoms and regain significant control over their daily lives. Unfortunately, getting the appropriate treatment, sticking with a treatment plan and maintaining treatment gains can be challenging. Knowing what to expect ahead of time can make a big difference in your success. Will I need to take medication to treat OCD? Sometimes a doctor will prescribe medication to treat OCD. Antidepressants classified as selective serotonin reuptake inhibitors (SSRIs) are frequently used because they’re known to decrease OCD symptoms in many people. They may also be helpful in reducing levels of depression and anxiety. Unfortunately, medication alone usually results in only a partial reduction of OCD symptoms. Therefore, many therapists recommend that medication is used in conjunction with Cognitive Behavior Therapy. How can I find (and choose) a therapist? Many clinicians lack the proper training to diagnose and treat OCD. Only a qualified cognitive behavior therapist can provide effective, appropriate CBT for OCD. Before committing to treatment with any therapist, it is critical to ask questions to help determine if he or she is competent to administer CBT. What if someone avoids treatment or refuses to get treatment? Everyone deserves to get relief from OCD. But in some cases, a person who suffers from this disorder may find it difficult to begin treatment or commit to treatment. There can be many reasons for this. I need to know more. What should I do? 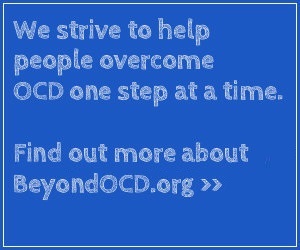 You can download or request free copies of OCD Guides from Beyond OCD to get current, detailed information about OCD. There are also a number of websites that provide information about OCD, related disorders, and treatment. And there are many books about these subjects, as well. In our More Resources section, you’ll find the web sites and books Beyond OCD has reviewed and selected to help you get the information and support you need. How can I get in touch with others who understand my life with OCD? When you or someone you care about has OCD, you’re not alone; countless others are facing similar OCD-related challenges. It’s also extremely important to know that many people have been successful in finding relief from OCD. Fortunately, a number of these individuals have been willing to share insights about their journeys to combat OCD. Read on for their stories of encouragement as well as other sources of support.